Preface. Introduction. 1. Effect of Scale on Performance. 1.1. Scale-down to laboratory reactors. 1.2. Performance of 12.0 & 1.2 meter long methanol reactors. 1.3. An alternative viewpoint for scale-up. 1.4. Flow and pressure drop in catalyst beds. 1.5. Heat and mass transfer in catalytic beds. 1.6. Diffusion and heat conduction in catalysts. 2. Experimental Tools and Techniques. 2.1. Batch reactors. 2.2. Fixed-bed tubular reactors. 2.3. Fluidized-bed reactors. 2.4. Gradientless reactors. 3. The Recycle Reactor Concept. 3.1. Genealogy of recycle reactors. 3.2. Overview of laboratory gradientless reactors. 3.3. The "ROTOBERTY"® recycle reactor. 3.4. Pump performance. 3.5. Measurement of flow in recycle reactors. 3.6. Balance calculations for recycle reactors. 3.7. Calculation of gradients. 4. Experimental Systems and Methods. 4.1. Conceptual flowsheet. 4.2. Test for the recycle reactor. 4.3. An experimental unit for reacting liquid and gaseous feeds in the vapor phase, or in a two-phase system. 4.4. Installation for ethylene oxidation experiments. 4.5. A semi-batch method for gas-solid reactions. 4.6. The batch method of Silva. 5. Executing the Experiments. 5.1. Routine tests for quality control. 5.2. Improved catalyst for an existing process. 5.3. Range finding experiments. 5.4. The ethane story. 6. Kinetic Measurements. 6.1. Recent history of kinetic studies. 6.2. General rules. 6.3. Kinetic model for a new process. 6.4. The workshop test problem. 6.5. Formalized methods. 7. Virtual and Real Difficulties with Measurements. 7.1. Effect of recycle ratio. 7.2. Catalyst bed non-idealities. 7.3. Influence of empty space. 7.4. Transient measurements. 8. Reactor Design. 8.1. Integration methods. 8.2. Handling of heat in reactors. 9. Thermal Stability of Reactors. 9.1. The concept. 9.2. Intuitive derivation. 9.3. Analytical solution. 9.4. Stability criteria explained. 9.5. Experimental requirements. 9.6. Execution of experiments. 9.7. Applications for design. 9.8. Multi-tube reactors. 9.9. Thermal stability in transient state. Postscript. Literature. Appendix Summary. Appendix A: The UCKRON-1 test problem. Appendix B: FORTRAN program for the exact solution. Appendix C: Calculation of operating conditions and transport criteria in the Rotoberty®. Appendix D: UCKRON test data from Excel. Appendix E: Regression of results from preliminary studies. Appendix F: Chemisorption. Appendix G: Calculation of kinetic constants. Appendix H: Reaction rate. Index. The science of catalytic reaction engineering studies the catalyst and the catalytic process in the laboratory in order to predict how they will perform in production-scale reactors. Surprises are to be avoided in the scaleup of industrial processes. The laboratory results must account for flow, heat and mass transfer influences on reaction rate to be useful for scaleup. Calculated performance based on these results must also be useful to maximization of profit and safety and minimization of pollution. To this end, information on products as well as byproducts and heat produced must be generated. If a sufficiently large database of knowledge is produced, optimization studies will be possible later if economic conditions change. The field of reaction engineering required new tools. For kinetic and catalyst testing, the most successful of these tools was the internal recycle reactor. Studies in recycle reactors can be made under well-defined conditions of flow and associated transfer processes, and close to commercial operation. The recycle reactor eliminates or minimizes the effect of transfer process, and allows the remaining ones to be known. • Provides insight into a field that is neither well understood nor properly appreciated. 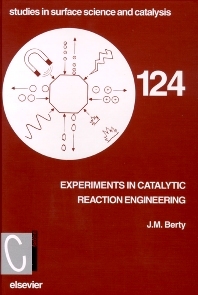 • Gives a deeper understanding of reaction engineering practice. • Helps avoid frustration and disappointment in industrial research. This book is short and clear enough to assist all members of the R&D and Engineering team, whether reaction engineers, or specialists in other fields. This is critical in this new age of computation and communication, when team members must each know at least something of their colleagues' fields. Additionally, many scientists in more exploratory or fundamental fields can use recycle reactors to study basic phenomena free of transfer interactions.